Is India’s opposition losing its way? The political edge which the opposition in India appeared to have gained from its successes in three recent assembly elections and several by-elections has dissipated. Surgical Strike 2.0 robbed the opposition parties of their momentum. More impetus was lost to the familiar malady of being too self-centred to take the initiative in building a mahagathbandhan or a grand alliance based on mutual accommodation. In contrast, the Bharatiya Janata Party (BJP) has proved to be more adept at evolving a sort of consensus among its allies that included the intemperate Shiv Sena, which has been carping over the last five years. Despite the reservations of the north-eastern parties over the anti-minority Citizenship Bill, the BJP succeeded in mollifying them to build an alliance in the region. For all their seeming arrogance, the Narendra Modi-Amit Shah duo know when to step back to placate a miffed ally. The Congress, on the other hand, has been steadily losing its members in ones and twos as they sense the opportunities on the other side. The party also made no effort to strike a deal with the Samajwadi Party (SP) and the Bahujan Samaj Party (BSP) in Uttar Pradesh in the belief that it is influential enough to fight on its own. As a result, the Congress may even face a challenge from the SP and the BSP in Amethi and Rae Bareli, its two pocket boroughs. Uttar Pradesh is a state where the Congress could have shown a better understanding of its diminished status, leaving the field open for the SP and the BSP. Instead, the Congress has confirmed the BSP supremo Mayawati’s fear that it intends to undercut her Dalit [lower caste] base. Her apprehension will be further strengthened by Priyanka Gandhi Vadra’s hospital visit to see the young Dalit leader, Chandrashekhar Azad Ravana. Such overtures validate Marxist leader Sitaram Yechury’s view that the Congress should get its priorities right: its primary objective is to defeat the BJP. Instead, the Congress appears intent on playing political games within the non-BJP camp, anchored in its ‘Middle Kingdom’ conviction of still being the grand old party of yore, capable of setting the terms of the political discourse. Similarly, the Congress has been hesitant in aligning with the Aam Aadmi Party (AAP) in Delhi and Haryana — a tactic which cannot but divide the anti-BJP votes. Some of these mis-steps are the result of Rahul Gandhi’s inexperience in deciphering the intricacies of a complex electoral scene. Unlike Sonia Gandhi’s famous walk to Ram Vilas Paswan’s house before the 2004 general elections, Rahul has taken no initiative to stitch up an alliance. Congress is alone in its lack of focus in fighting the BJP. Other parties too have been more interested in saving their bailiwicks from the BJP than in adopting a national perspective. Among them is Mamata Banerjee who believes, perhaps rightly, that her main opponent in West Bengal at present is the BJP. But that didn’t prevent her from keeping Rahul out of a Kolkata rally presumably because of the fear that his presence would have detracted attention from her performance as a preparation for a larger role on the national stage. 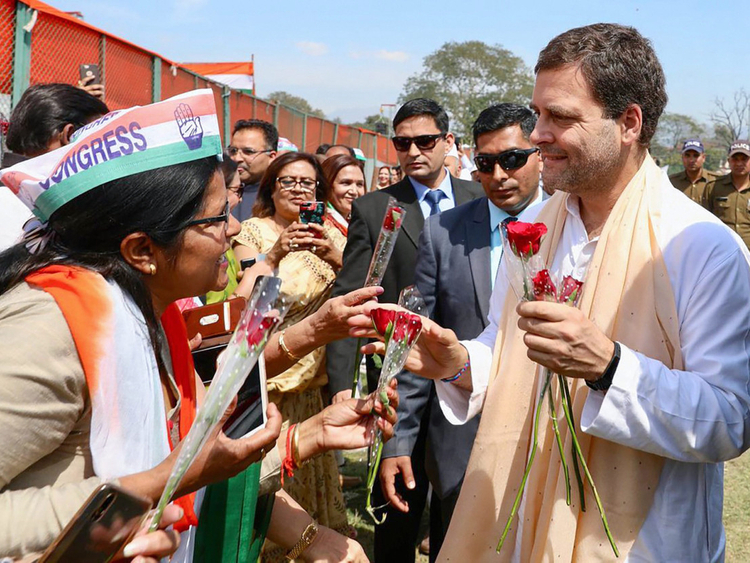 If Rahul has been virtually carrying the opposition campaign on his shoulders with no other leader choosing to stand by his side, the reason is his inability to establish rapport with the others. Since he is not as effective a speaker as Modi, Rahul and the other opposition leaders could have focused on more public meetings, even relatively small ones, where leaders such as Sharad Pawar or Yechury or Omar Abdullah or Tejashwi Yadav or M.K. Stalin could have participated along with the Congress president. It is not always necessary to hold a “mega” rally to make a point. In the absence of such concerted endeavours, the opposition appears to be losing the plot. Opinion polls have indicated that despite the prevailing nationalist sentiments following the air strikes on the Jaish-e-Mohammed hideout in Pakistan, the general elections may still produce a “hung” parliament. The reason, as a poll has shown, is that unemployment and not terrorism remains the primary concern of the ordinary people. Moreover, as the views of more than 100 academics have shown, the government’s efforts to hide or fudge data on employment have not proved successful. All is, therefore, not lost for the opposition. But it is up to the Congress to take the lead as the first party among equals to target the primary opponent and not see rivals in the opposition’s ranks. Amulya Ganguli is a political analyst in India.